Auto Layout dynamically calculates the size and position of all the views in your view hierarchy, based on constraints placed on those views - by Apple. Auto Layout can also be understood by describing it as a set of rules you use for each of the views in your view hierarchy, which rule defined how the alignment and shrinking or extending of the view will be performed according to different screen sizes of devices. We should use Auto Layout in all of our projects because this helps us to manage the design of the screens for all the available devices we are targeting. For this we just need to understand what it is and how it perform and after we understood how it works, deigning dynamic layout for multiple devices will be fun. If you want to add a UIImageView to the center of the screen with width and height of 100 pixel, you need to set center x constraint and center y constraint to the superview from the UIImageView and width, height constraint to the UIIMageView. Here is the code. There is way to do this in storyboard but i have written in code because its understandable for this situation in documentation. To use auto layout we need to enable a boolean flag in storyboard. Its shown in the below image. After this we can use auto layout in our storyboard. There is another option if we want to use size classes or not. Size class is also a helpful option in auto layout which helps us to design for different device screen sizes differently with same or different elements. The image for the setup goes here. 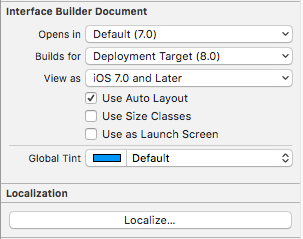 Its from the file inspector panel of the property editor in Xcode. Lets define a new view, that has a textfield and two buttons with equal heights with margins between them, and a label below. The buttons should have equal widths and the label should overflow to the next line if content is long enough. This view should be sized automatically according to its content on both horizontal and vertical axis and centered in the middle of its superview.